The Big Eagles Hall, the familiar haunt for Patrick Smith's amateur MMA promotion, swelled to capacity for the promotion's 57th event. A youth grappling tournament, and a kickboxing exhibition kicked off things early, but the evening's main event saw two lightweights with an eye on the title. Colin Parr from Watson Martial Arts improved to 7-1 to win the Cage Champs Lightweight title with a convincing performance over Daniel Jefferson. Despite a switch of opponents only four days out, Parr was able to make adjustments to dominate all three rounds. With Parr's striking coach Luke Nelson in the corner, Parr worked a flurry of combinations that had Jefferson covering up against the cage early and often in the first two rounds. Jefferson's gameplan seemed to focus on wearing out Parr looking to connect with a big punch, which he threw whenever Parr would let up. Late in the third Parr nearly had a triangle to armbar submission, but a close proximity to the cage prevented a finish. Despite a questionable scorecard from one of the three judges, the official result was a split-decision for Parr. Once the results were read, many were left scratching their head. Destruction MMA's young gun Bill Smith made his MMA debut for Cage Champs. 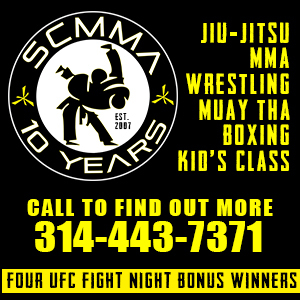 Smith, finally old enough for MMA, is a veteran of amateur kickboxing for several years around the area. It didn't take him long either, as Smith ran through his opponent to get a first round TKO stoppage. James McAffee from the Academy of Courage was victorious with a second round TKO in the nights third. McAffee muscled his way to victory pinning his opponent Kenny Murray against the cage to work his dirty boxing before getting the fight to the ground in the second where he would win via ground and pound. Quentin Garrison looked razor-sharp for the first two rounds before he started to fade, but it was enough for Garrison to win a unanimous decision in an exciting K1 match-up. It was all Dylan Burns in his match-up with Tony Lanzarine. A late punch after the bell spoiled what was other wise a flawless first round that saw Burns win when Lanzarine couldn't answer the bell for the second. Academy of Courage prodigy Alex Russo was victorious in a special rules MMA match against Danny Quaite presented by Fighting For Autisum. Russo was able to get into top position early in the second round and won via kimura. After the fight Russo was carried high above the cage by coach Kain Royer much to the delight of the fans who were on their feet for the entire fight. Ace Anderson defeated 50-year old Craig Dalton in their kickboxing match-up. Anderson wins via first round KO. Willie Henderson bested Anthony Phillips winning with a second round TKO. Local MMA standout Nathan Stearns started off slow, but racked up submission after submission in an exhibition grappling match-up. 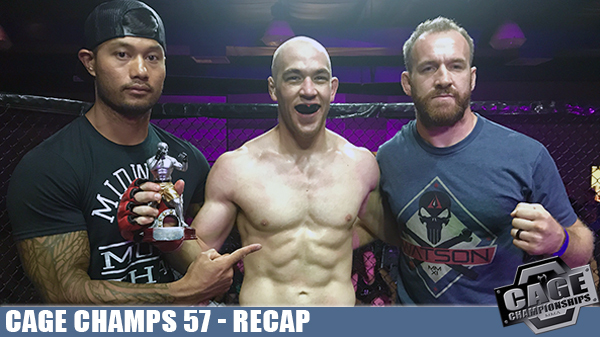 Zoey Hahn wins a back and forth K1 match-up against traditional Muay Thai fighter Zoie McAffie, and in a four person grappling tournament Harrison McCormick from St. Charles MMA was the best of the four winning his two matches to claim the grappling tournament champion.